5.8 Earthquake hits the Bali Sea. 5.5 Earthquake hits near the coast of southern Peru. Tropical Storm Vance forms about 450 mi…720 km S of Acapulco Mexico with maximum sustained winds…45 mph…75 km/h. Present movement…WSW or 245 degrees at 3 mph…6 km/h. Tropical cyclone (tc) 04a (Nilofar), located approximately 281 nm south-southwest of Karachi, Pakistan, and is tracking east-northeastward at 05 knots. A microbe recently discovered in the melting Arctic permafrost appears to be releasing vast amounts of the greenhouse gas methane, possibly speeding up climate change. Methanoflorens stordalenmirensis “breathes out methane like we breathe out carbon dioxide,” said lead author Carmody McCalley, a scientist at the Earth Systems Research Center at the University of New Hampshire. Methane makes up only about 9 percent of all the greenhouse gases in the atmosphere, but it can store up to 21 times more heat than carbon dioxide. 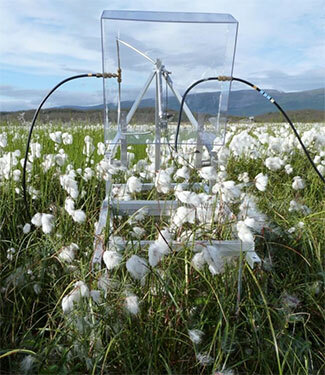 Researchers say they hope the microbic discovery will help scientists improve their simulations of future climate by providing a more accurate picture of how thawing permafrost releases greenhouse gases. The week’s hottest temperature was 112.1 degrees Fahrenheit (44.5 degrees Celsius) at Santiago del Estero, Argentina. The week’s coldest temperature was minus 69.7 degrees Fahrenheit (minus 56.5 degrees Celsius) at Russia’s Vostok Antarctic research station. Turrialba (Costa Rica): A relatively large explosion occurred at the volcano last night at 23:40 local time. According to local news, the eruption lasted about 45 minutes and was accompanied by strong seismic activity, which was felt by the local population. As the eruption occurred at night, there are no visual reports. Copahue (Chile/Argentina): Signs of unrest at the volcano have decreased and SERNAGEOMIN lowered the alert level back to yellow: Seismicity declined during the past days, the volcanic edifice showed deflation and a crater lake has reformed at the bottom of El Agrio crater. Glow from the summit, probably caused by very hot gasses, was last seen on 27 Oct (but bad weather prevented observations since). Two 5.2 Earthquakes hit New Britain, Papua New Guinea. Tropical cyclone (tc) 04a (Nilofar), located approximately 294 nm east of Masirah Island, and is tracking northeastward at 05 knots. Tropical Cyclone Nilofar will be far from the dangerous cyclone it strengthened into earlier this week when it impacts India and Pakistan, but localized downpours are still a threat, however. Nilofar reached its peak intensity on Tuesday with maximum sustained winds of nearly 215 kph (135 mph), making Nilofar a very severe cyclonic storm and the equivalent of a minimal Category 4 hurricane in the eastern Pacific or Atlantic basins. Nilofar is now losing its battle with disruptive wind shear (strong winds above the surface) which as caused the cyclone to weaken to the equivalent of a tropical storm. 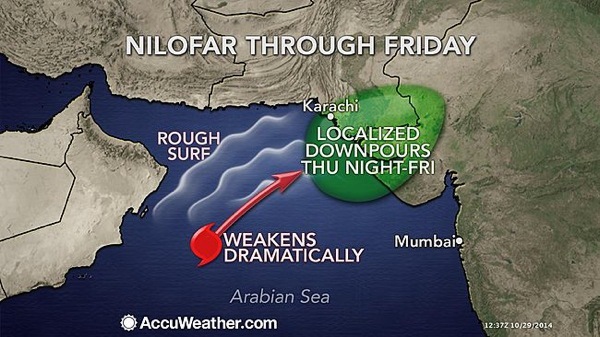 Nilofar will continue to weaken through Friday. Norway – Heavy rainfall in western Norway has caused severe damage to infrastructure and constructions. Many are left homeless. Houses, sheds washed away by Opoelva in Odda, Hordaland County. Hundreds evacuated from their homes in the region. Floods and landslides close over 20 roads. Worst flooding since 1892. On 19 October 2014, the National Health and Family Planning Commission of China notified WHO of 2 additional laboratory-confirmed cases of human infection with avian influenza A(H7N9) virus, including 1 death. Stromboli (Eolian Islands, Italy): The effusive eruption that had started on 7 August seems to be ending: the lava flow emitted from the 650 m vent at the eastern base of the summit crater complex has decreased a lot two days ago and seems to have almost (or completely) stopped by today. INGV Catania reports strong degassing from the summit vents. Bardarbunga (Iceland): Huge lava effusion rates continue to characterize the ongoing eruption at the Holuhraun fissure. There are no signs of the eruption ending soon. Earthquakes continue to be frequent under the central volcano’s caldera. Shiveluch (Kamchatka): An ash plume was reported last evening rising to approx. 30,000 ft (9 km) altitude and extending east (Tokyo VAAC). Most likely, a collapse of a part of the growing lava dome (or an explosion) occurred. In the first case, the ash plume is likely associated with a pyroclastic flow. Popocatépetl (Central Mexico): Overall, the volcano’s activity has remained unchanged. Occasional explosions produce ash plumes that rise 1-2 km above the volcano. Yesterday, the volcano was a bit more active and had 5 such eruptions. Overnight incandescence is observed comming from the central and east sector of the crater. Santiaguito (Guatemala): The viscous lava flow on the eastern side continues to advance slowly. No significant explosive activity from the lava dome has been reported recently. Fuego (Guatemala): The volcano’s activity has been stable over the past weeks. Mild to moderate strombolian explosions continue. Yesterday, the observatory reported 11 weak explosions (ash plumes rising up to 500 m) and 13 moderate ones (ash plumes up to 800 m). The plumes drifted SE and W for approx. 10 km before dissipating. Light ash fall occurred in downwind areas. The explosions at the summit produce incandescent avalanches on the upper slopes of the volcano. 5.4 Earthquake hits the south Indian Ocean. Tropical cyclone (tc) 04a (Nilofar), located approximately 203 nm south-southeast of Masirah island, and is tracking northward at 06 knots. China – Rain-triggered landslide in Yunnan Province of China has claimed the lives of at least nine people. Sri Lanka – At least six people were killed and about 300 were missing in central Sri Lanka on Wednesday after an early morning landslide set off by heavy monsoon rains. About 150 homes at the Meeriyabedda tea plantation in the district of Badulla, most of them small rooms constructed in a line and attached to one another, were crushed under mud around 7:30 a.m. It had been raining for days in the area, disaster management officials said. Beyond the recovered bodies, many more are believed to be beneath 10 to 15 feet of mud. Ebola: Who is patient zero? Before the virus ravaged West Africa, before the deaths soared into the thousands, before the outbreak triggered global fears, Ebola struck a toddler named Emile Ouamouno. Virtually no one knew the 2-year-old by name. Now the world knows him as patient zero. Researchers from The New England Journal of Medicine believe Emile was the first person to contract the disease in the current outbreak almost a year ago. It’s not clear exactly how the boy, who lived in a rainforest village in southern Guinea, got infected. Ebola can be spread from animals to humans through infected fluids or tissue. “In Africa, infection has been documented through the handling of infected chimpanzees, gorillas, fruit bats, monkeys, forest antelope and porcupines,” according to the World Health Organization. In December, Emile had a fever, black stool and started vomiting. Four days later, on December 6, he was dead. Within a month, so were his 4-year-old sister, his mother and his grandmother. The mother suffered bleeding symptoms and died on December 13. Then, the toddler’s 3-year-old sister died December 29, with symptoms including fever, vomiting and black diarrhea. The grandmother passed away January 1. Taiwan’s Centre for Disease Control (CDC) on Tuesday raised the alarm level over an epidemic of dengue fever, which has caused seven deaths this year. As of Tuesday, Taiwan has reported 7,439 cases of dengue fever, a mosquito-borne viral disease. Among them, there were 59 cases of dengue hemorrhagic fever, a potentially fatal complication, including seven deaths in the southern city of Kaohsiung. CDC Director-General Steve Kuo said the number of cases of this year’s outbreak had broken Taiwan’s 2002 record, when over 6,000 cases, including 19 deaths, were reported. Kilauea (Hawai’i): Today’s preliminary reports from Pahoa indicate the lava flow is only advancing around 10m/hr after having consumed a small shack on private property, and is still threatening other structures nearby. The slowing comes as lava fills a small depression in the topography, with steeper ground and faster movement rates expected ahead. Based on current projections, the lava will most likely cross Pahoa Village Road sometime tomorrow, though with lots of uncertainty as there has been no increase yet in the flow’s speed. Residents and visitors have been cycling through the main village road, which has been partially closed as the utility company installs new, taller power poles to move wires farther from the heat of the lava, while continuing to insulate the base of the poles against burning. A similar approach has been effective so far on Apa`a Rd, though the lava is likely to expand and test these defences further in coming weeks. Dukono (Halmahera): Explosive activity at the volcano continues. An ash plume at estimated 10,000 ft (3 km) altitude was seen drifting 45 nautical miles to the east on satellite data today (VAAC Darwin). Tropical cyclone (tc) 04a (Nilofar), located approximately 317 nm south-southeast of Masirah island, and is tracking northward at 02 knots. Tropical Storm Hanna forms from Tropical Depression 9 and then dissipates in the eastern Caribbean. The remnants located about 95 mi…150 km WSW of Cabo Gracias a Dios on nic/Hon border with maximum sustained winds…35 mph…55 km/h. Present movement…W or 270 degrees at 5 mph…7 km/h. Heavy rains still expected to continue over Honduras and northern Nicaragua.